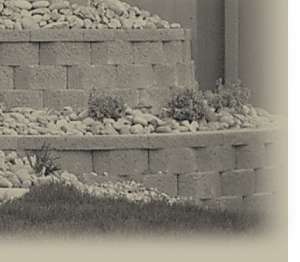 In addition to installing retaining wall systems, we also use retaining wall block (also known as modular block) to build sitting walls, pillars, courtyards, stairways / steps, flower beds / planters and window wells. We also install flagstone patios, paver patios, paver driveways, pathways and landings and do tree and shrub plantings. Retaining wall design & construction - including sitting walls, courtyards, flower beds, pillars, window wells and stairways and steps. Paver design and installation - including paver patios, pathways, driveways and landings. Contact us today for a free consultation and estimate*. *Please note that the free estimate only applies if you currently own the property with which you desire to have a retaining wall or paver project installed. If it is for a property you are thinking of buying, I do charge a nominal fee to come out and look at it and give you a quote.